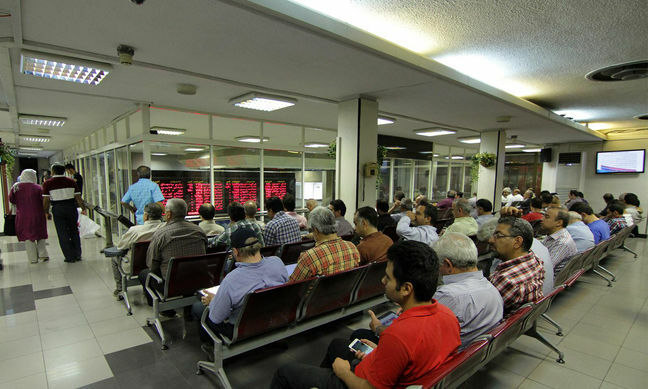 EghtesadOnline: Tehran's stock market bulls continued to lift up equities in a dramatic Tuesday trade that saw indices break even more records after showing signs of sinking in early trade. About 20 minutes past the market opening, Tehran Stock Exchange's primary index TEDPIX started going downhill. Escalating sell pressure on Monday, especially near the market close, could signal a creeping correcting movement for the index. The money avalanche in the market, however, prevented things from going south and the index picked up again in less than 15 minutes and grew by about 1,100 points by 11:30. But then came the actual shock: National Iranian Copper Industries Company's shares returned to trading after a day of being blocked for fluctuating more than 20% and the sizable demand for its shares boosted TEDPIX by 895 points in 10 minutes, according to Financial Tribune. Trade was rather dormant past midday and by the day's close, TEDPIX gained a total of 1,970.46 points or 1.89% compared to Monday and closed on Tuesday at a new high of 106,504. Over 2 billion shares worth $126 million were traded at TSE on Tuesday to register a 21.5% and 25% decline in the number of traded shares and trade value respectively compared to Monday. TSE's other market boosters, apart from NICICO, were Mobarakeh Steel Company, Tamin Petroleum and Petrochemical Investment, Parsian Oil and Gas Development, Chadormalu and Golgohar mining companies, and Omid Investment Bank. Market heavyweights are continuing to account for more and more of TEDPIX's spikes in recent days with the smaller companies' roles dwindling, as expected. The TSE 30 index, which tracks the market's 30 largest firms, outdid TEDPIX by growing 3.48% and extending its historical high, again. This is while the equal-weighted main index stalled for the first time after rising more or less alongside TEDPIX in every win. The equal weight index, as the name implies, gives the same importance to each stock the index tracks and makes it easier to follow the overall market performance despite the companies' market caps. It inched down 3.98 points or 0.03% to 13,336, suggesting that smaller firms might be losing their mojo. Meanwhile, Free Float Index outdid TEDPIX as it rose 2.22% or 2,552.2 points to a new high of 117,677. This index takes the equities' prices and multiplies them by the number of shares readily available in the market, instead of including locked-in shares such as those held by insiders, promoters and the government. Iran Fara Bourse had an equally volatile trade and ended up closing higher, although the uptick was less pronounced compared to TSE. IFX gained 11.37 points or 0.97% to end at 1,213.4 points, which is another all-time high and marks the sixth consecutive winning day for the benchmark index. Over 565.6 million securities worth $78 million were traded at IFB on Tuesday. The number of shares traded dropped 76% compared to Monday, yet trade value grew 2%. Zagros Petrochemical Company was again at the top of IFX boosters with 3.87 points and the rest also were made up of Monday's chart toppers, with names such as Marun Petrochemical, and Hormozgan and Esfahan steel companies. In the last fiscal year (ended March 20, 2018), the Securities and Exchange Organization issued a directive to freeze stock tickers that experience a fluctuation of 20% in less than five trading days. In order to reopen, companies are required to release a statement explaining price volatility as soon as possible. When first introduced, the measure was meant to curb suspicious insider trading during the market's recession days. However, at present, when indices are flying past new marks every day, this seems to be putting brakes on a growing market. This proved to be a headache on Tuesday, especially for the fast-growing base metals stocks. Mobarakeh, Khuzestan, South Kaveh, Hormozgan and Arfa steel companies were all locked out of the trade as their shares fluctuated past the 20% mark while demand was still high for them. Iron ore and zinc stocks were also in the same league, alongside petrochemical shares such as Zagros and Jam, according to Financial Tribune's sister stock market news service Donya-e-Bourse. It has to be noted that first, the 20% fluctuation basically cannot happen in a single trading day, as there is a 5% cap on daily growth or loss at Iran's capital market. Second, the 20% cap is not necessarily tied to growth and includes the downticks, too. The metal stocks' freezing was, therefore, expected, considering the day's early index downtick. Tuesday's champion, NICICO, was also subject to share freezing, as its share price jumped after it opened for trading mid-Tuesday. It was closed since last Wednesday for "revealing sensitive information", an impediment over publishing last fiscal year's (March 2017-18) delayed financial statements. Given the current market trend, seeing above 20% fluctuations seems likely in the upcoming trading days. SEO officials told Bourse 24 that the regulation will continue to be implemented and that it depends on the companies to reopen their shares. "The directive is what it is and is not going to change," said SEO official, Vahid Roshanqalb. "If firms publish the required information during the trading hours, they'll reopen, and if not, it will move over to the next day."